Our Mission: To provide the scientific basis to manage southern bottomland hardwood and wetland forests and associated stream ecosystems for a sustained yield of forest products and other desired values. The 1,044 ha Delta Experimental Forest in Washington County, MS is located near our Southern Hardwoods Laboratory and has provided the backdrop for many Forest Service research studies since its establishment in 1945. Read more about the Delta Experimental Forest and our research projects in this CompassLive article. The 1,416-ha Tallahatchie Experimental Forest, located in the Upper Coastal Plain on the Holly Springs National Forest, near Oxford, MS and our Forest Hydrology Laboratory, was created in 1950 to study relationships between mixed pine and hardwood forests, flooding, and soil erosion. Read more about the Tallahatchie Experimental Forest and our research projects in this CompassLive article. Forestry technicians Chuck Walker and Shelley Griffin, and biological science laboratory technician Aaron Lancaster with the Center for Bottomland Hardwoods Research in Stoneville, MS, collaborated with the Winterville Mounds to present their Annual Native American Days Festival. The Winterville Mounds is a National Historic Landmark located north of Greenville, MS, that was built by a Native American civilization that thrived from about 1000 to 1450 A.D. Winterville Mounds features 12 ceremonial mounds, two plazas, a museum and a park located on 42-acres. Paul Hamel, retired research wildlife biologist with the CBHR, serves as vice president of the Winterville Mounds Association, and spends a considerable amount of time as a volunteer. During the two-day event, more than 2,000 attendees learned about Native American culture from basket weaving, pottery, mound building demonstrations, games, and food. The annual celebration ended on Oct. 26 with Night at the Mounds, featuring a “Great Fire” showcasing the Oklahoma Quapaw Tribe’s dance troupe, Best Feather Dancers performing traditional Native American dancing, chanting, and storytelling around the substantial bonfire fueled by wood recycled from biomass and entomological research projects. Mark Howell, director of the Winterville Mounds Park and Museum, invited visitors to enjoy an unforgettable night under the stars by viewing the night sky through telescopes staggered throughout the Mounds! Mississippi has one of the most diverse crayfish faunas in the world and is home to at least 17 endemic species (meaning they occur nowhere else). View our Mississippi species list, photo galleries, fact sheets, distribution maps, and more. 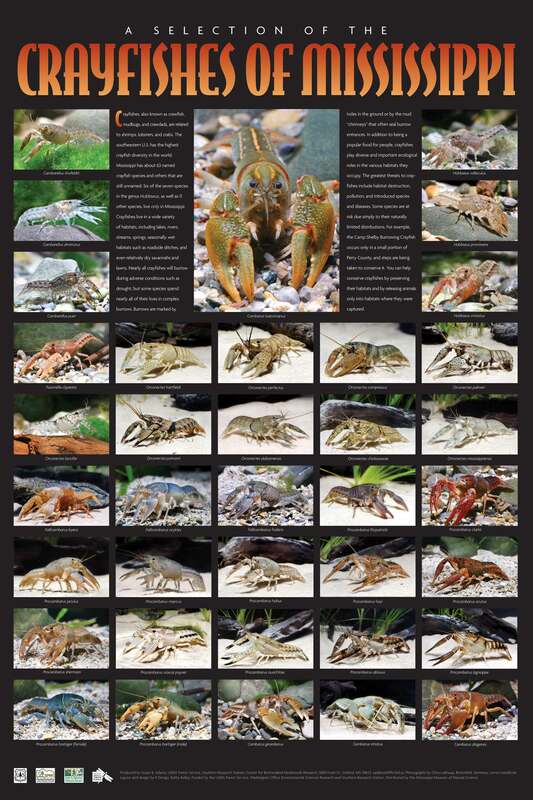 Download a free poster featuring over 30 color photos of Mississippi crayfishes. In 2010, the International Union for Conservation of Nature (IUCN), led by scientists with the Zoological Society of London (ZSL), assembled a group of 76 experts, including CBHR's Dr. Susan B. Adams, to apply the IUCN Red List criteria to the conservation assessment of all 590 of the world's freshwater crayfish. Since the southeastern US is one of the global centers of crayfish diversity, Dr. Adams' research with Crayfish in Mississippi and other areas of the South was an integral part of this assessment. Read more about this project, check the status of a crayfish species, or visit our Crayfishes of Mississippi website. Pondberry (Lindera melissifolia) is a rarely seen woody plant that grows in seasonally flooded wetlands and on the edges of sinks and ponds in six southern states. The U.S. Fish and Wildlife Service listed it as an endangered species in 1986. Much of the land where pondberry previously occurred has been converted to agricultural fields. Drainage and flooding of wetlands and timber cutting have also affected pondberry populations. As part of a conservation program, it is essential to find all of the existing pondberry populations so that we may follow the growth or decline of the species. CBHR's Guide to Finding Pondberry (Lindera melissifolia) is designed to help both amateurs and professionals correctly identify pondberry throughout the year. If you find a new population of pondberry, please contact us. We will add your information to the database we developed to track pondberry populations in the South. We've all heard of counting a tree's rings to determine its age, but did you know a similar procedure is used to determine the age of mussel shells? Learn more about this process by viewing our captioned photo album "Aging Mussel Shells".